I finished knitting up Fluffy's vest the last night, and I am now ready for the felting/fulling/whatever adventure to begin. When I bound off the piece, it measured 16" wide x 7" high. The original vest was 9" wide x 3.5" high. I had intended to make my swatch exactly twice as big since I am not really sure just how much shrinkage (can anyone use that word without thinking about Seinfeld and snickering anymore???) was going to occur. However, I was obviously knitting tighter than I did on my test swatch, so we'll just see if it still works. 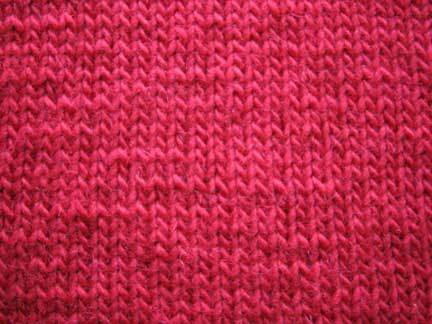 I place my knitting into a zippered pillowcase and set off to the basement and the washing machine. I let the agitator begin, and I set my kitchen timer. The knitty article says to check on it every 5 - 10 minutes, so I decide that 7 sounds good. At the sound of the beep, I head down to the basement. After the first seven minutes: Opening up the washer, I am greeted by the sight of suds, perhaps slightly pink suds? Hmmm - wasn't expecting suds since I used only a tablespoon of Tide, but OK... I reach my hand down into the suds and - Sweet Cracker Sandwich! - I promptly scald myself. See previous comment about "hottest water? check." Should have seen that coming, but, surprisingly, didn't. I look around the basement and spot this big hoop of copper wire that I once used to do something with; something which has long since been forgotten. I grab it, and awkwardly use it to fish around and snag the pillowcase. This accomplished, I open it up and peer inside. Hmmm.....it looks exactly the same as it did when I chucked it in. Except wet. And it smells like dog. 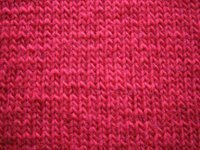 I inspect more closely, and realize that the edges of the piece, which I did in straight stockinette stitch with no ribbing, has curled up upon itself and is beginning to fuse into a big round edge. A-ha! That's why you need to check on this stuff! I carefully peel back the edge so that it is no longer binding together. I put it back into the pillowcase, zip it back up, and chunk it back into the washer. Seven Minutes Later: This time, I take a coat hanger down with me. It is much more satisfactory than the big cooper hoop for fishing out the soggy pillowcase. Peek inside. There is some fuzz accumulating inside the pillowcase, which is to be expected (and is why, in fact, I am using the pillowcase, so as to keep the fuzz from gunking up my washer.) The piece looks tighter now; shorter in height, but perhaps longer in width? I make sure that the edge isn't rolling in on itself and put back in. Seven More Minutes Later: OK, I've got the hang of this now - caught it on the first attempt with my trusty coat hanger and didn't burn anything! It is actually starting to look like something now - kind of exciting. I can no longer see gaps in between stitches when I tug on it like I could previously. 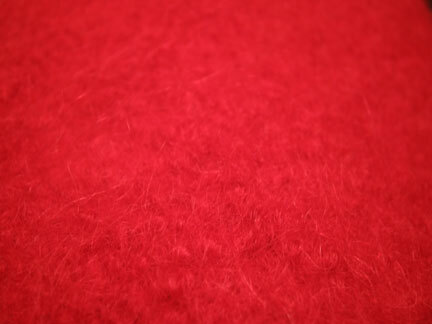 The wrong side of the piece actually has a texture like this old boiled wool jacket that my mom used to have. I wonder if I can take it out now, but decide that since I can still tell between the right and wrong side that I'll give it a little more time. Ten Minutes Later: Hmmm - I can no longer tell the right from the wrong side. However, I never know when to quit. Just to be in the safe side, I am going to leave it in for a final ten minutes. I want to be able to cut armholes, etc., without having to hem the edges. As I put it back into the washer, I realize that the water has cooled considerably (read: it's not burny anymore.) I have just been setting the wash cycle back to agitate, but I decide to let the water drain, and start over with new hot water for this final round. That ought to take care of any residual suds.